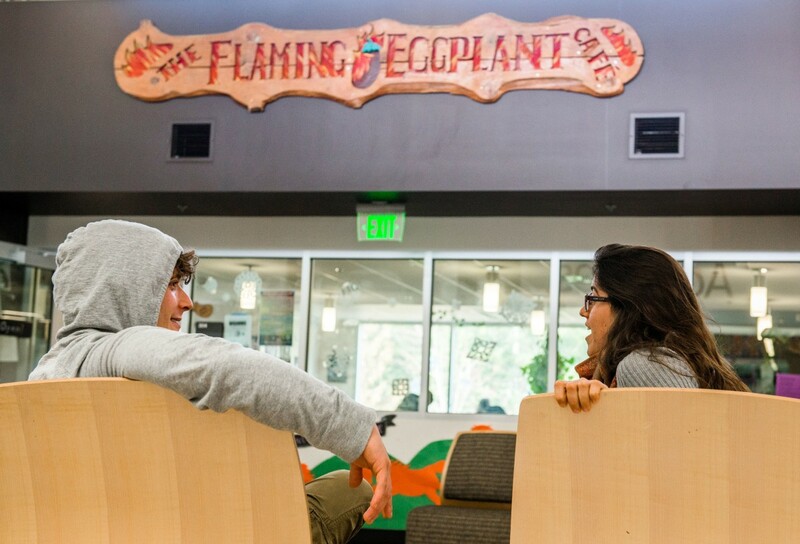 The Flaming Eggplant Cafe is a student-run collective cafe located in the beautiful Evergreen State College campus. We are located on the 3rd floor of the CAB Building across from Student Activities at the Evergreen State College (to people who are non-Evergreen students, the CAB Building is located on the left of the front building you entered when you go through the bus stop). “The Flaming Eggplant Café exists to provide a non-corporate food option to people at The Evergreen State College located on occupied Nisqually and Squaxin land, in Olympia, WA. As a student-run collective, we make efforts to source our food carefully, considering the impact of our vendors and distributors – balancing rising food costs and declining planetary stability while recognizing unjust treatment of workers and the world-wide effects of greenwashing. We prioritize our worker’s needs and education while providing learning experience in food service and cooperative management. The café is intended to be a safer space that opposes systemic oppression, where students, faculty, and staff can hold events, organize, decompress, and – importantly – eat."